I love to customize my makeup. I love to mix foundations from different brands and in different shades to create my very own, DNA-distinct foundation or concealer, since I have a previously mentioned, hard-to-match skin tone. There is something thrilling about participating in makeup alchemy and sorcery — all of which takes place in my bathroom in the morning while I get ready for work. I have often used the back of my hand as my mixing board. I pump a drop from two foundations, grab a brush, and mix them on my hand until I get the consistency or color that I want. Sometimes, my body heat helps melt it. Other times, my oily skin can make my custom color feel a bit “meh.” I have decided to retire my hand as my makeup easel because EcoTools Custom Match Duo is the best thing to happen to makeup mixers this year. 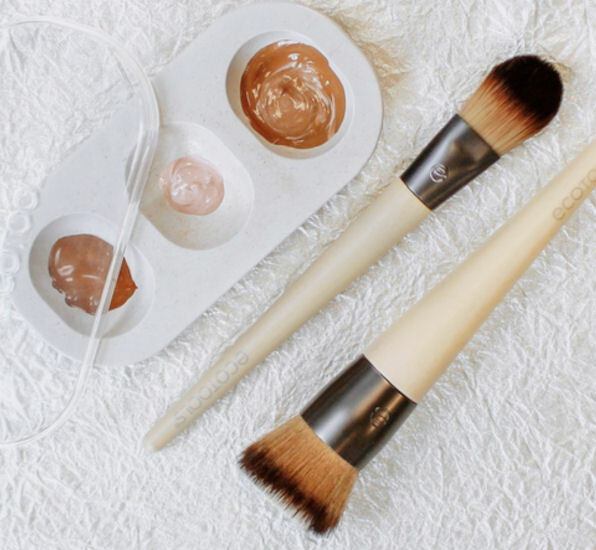 The three-piece set boasts the brand’s Classic Foundation Brush, Base Buffer Brush, and the Mix & Cleanse Palette. The brushes work in concert with the palette to give you the best finish for your face. But it’s the palette that is truly genius and it replaces the back of the hand as mixing real estate. There are three compartments. You can mix highlighter, moisturizer, foundation, or whatever product you wish to wearable perfection. There are endless combos and creative possibilities. The brand recommends that you use the Custom Match Duo with liquid foundation and moisturizer to enhance that always-desired dewy glow. But you can use this palette as you wish. It allows you to flex your creative makeup muscles. Bonus: You can use the ridged bottom to wash your brushes.